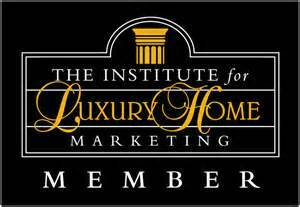 The Institute for Luxury Home Marketing – The Institute exists to help real estate professionals provide high quality service to the buyers and sellers of luxury homes. The Certified Luxury Home Marketing Specialist (CLHMS) designation assures affluent buyers and sellers that the agents who have earned it have the knowledge, experience, competence, and confidence they require. The Luxury Home Council – Accredited Luxury Home Specialist (ALHS) agents are members of an elite group of exceptional real estate professionals dedicated to their professionalism. As a testimony to their commitment, these high caliber agents subscribe to The Luxury Home Council’s strict guidelines that demonstrate the agent’s expertise in this highly demanding segment of the real estate marketplace. These highly sought after certifications – ALHS and CLHMS – are recognized both internationally and in the U.S. as representatives of the elite in the real estate industry. For more information on our luxury homes real estate services, please contact The Doug Erdy Group today!